We are pleased announce our 2013 Spring & Summer Wine Tasting season! I have written about how being a judge differs from being a critic, the former stressing objective analysis and the suppression of any personal bias to provide a neutral assessment of what’s in the glass. The art of judging wines depends heavily on the utilization of a structured framework and technique along with a practiced palate. While I won’t be able to make everyone who attends this class an expert wine judge, it is my hope to be able to provide the tools and guidance to begin the journey. At this event we will taste several wines, red and white from a variety of regions, grapes and price points in a blind simulation of a wine competition. At the conclusion we will compare our results with those of both professional judges and critics to see how we did. Wine making got its start in the Old World vineyards of Europe, some of which chart their beginnings back to the 1st century. Wine making countries like France have been the standard-bearer for these Old World bastions of wine. With the migration of Europeans across the globe, wine as a function of their many cultures followed them to their new homes. The result has created an interesting phenomenon, with distinct differences arising between wines made in the Old World and those made in the New World. At this event we will taste a number of wines from both well-known Old World and New World regions in a comparative analysis. We will also serve a collection of artisanal cheeses from both Old World and New World producers to complement the experience. Back in 2004, we conducted a simulation of the famous 1976 tasting that pitted Cabernet-based wines from Napa Valley against the some of the best that Bordeaux had to offer. In 2007, 2009 and 2011 we again reprised the famous standoff. Popular demand has brought this event back to Musings, so once again we will put these two regions to the test. At this event we will taste at least six wines in a reenactment of the historic 1976 tasting. Of course, the wines will be from more recent vintages, but the experience should be quite similar. Sign-up soon, because these events will sell out quickly! Contact: paul_malagrifa@musingsonthevine.com to reserve your seats today! To me, Barbera always brings back memories of slices of steaming hot pizza, gooey with cheese, loaded with mushroom, sausage and maybe caramelized onion… Or, perhaps a nice slab of Lasagna Bolognese, sprinkled with Parmigiano-Reggiano and crushed red pepper… the point is, Barbera is about simple pleasures. For years I remember buying cases of sub-$10 Barbera and serving it as my house red – infinitely quaffable with no pretense except to please. Well, it turns out that Barbera has, in a phrase, grown up. Somewhere along the way, Barbera producers got serious and decided they were going to produce wine for a more discerning palate. 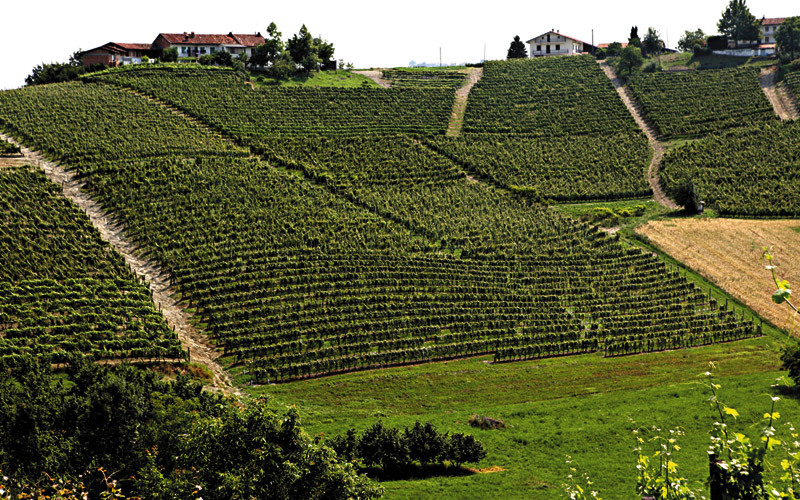 Giacomo Grimaldi is a small, family run winery in Langhe, Piedmont that, since 1930 has been producing some of the finest the region has to offer. Known for holding their wines for extended periods, Grimaldi’s Barolo wines are among the best. Similar care is taken with the Barbera wines from Grimaldi. Grimaldi’s Barbera grapes are sourced from three vineyards located in Monteforte d’Alba, Barolo and Novello. The soils are primarily calcareous clay, which promotes a strong minerality in the wine. Vinification is in stainless steel with an extended maceration of 5 to 6 days, giving the wine a dark, deep ruby hue. Temperature control preserves the more delicate floral notes of the varietal and Malolactic fermentation softens the wine’s structure. The wine is aged in stainless steel for 9 months before bottling – no use of oak gives the wine a clean, fruit-forward style. Make no mistake, this is serious Barbera, but it is youthful and fun as well. I tasted the wine over two days, with nothing but a cork in place over night and it was magnificent. I actually enjoyed the wine more on day two – it had shed some of its reticence and blossomed into quite the seductress. Bright, cherry nose with rose petal, mineral and anise hints. Medium-bodied with firm acidity and moderate, dry tannin – good balance. Sour cherry, tart with tarry, herbaceous notes. The wine really evolves with some time, showing a nice dark core of fruit and some bittersweet chocolate flavors. Moderate length, starts out tight but shows real potential as the wine breathed. Drinking well now and should improve over the next 3 to 5 years. At an average bottle price of $23.99 before the discount, this wine is not exactly cheap, but it is very respectable Barbera with serious pedigree! White wine in the middle of winter? Sure! Especially when the white wine is lush, structured and filled with complexity. The Masseria Li Veli is a winery located on an ancient Messapian site, dominating the fertile and sunny Salento plain. The Salento region, also known as the “heel of the boot” (of Italy), is situated in the southern part of Apulia, between the Ionic and Adriatic seas. In the First century B.C. it was the land of the Messapi, whose name meant “people between two seas”. The property was originally founded by the Marquis Antonio de Viti de Marco (1858 – 1943), an internationally known Italian economist, university professor and Radical Party Deputy of the Reign of Italy. The Marquis had wanted to transform Masseria into a model cellar for the entire south of Italy. Although this did not happen in his lifetime, the Falvo family, owners of the property since 1999, has taken 40 years of experience in the wine business to rejuvenate the property as well as the dream of the Marquis. The climate of this area is ideal for the cultivation of the vine with mild winters and hot and dry summers. The strong diurnal weather pattern makes this peninsula the perfect place to ripen grapes. The soil of Masseria Li Veli is karstic, mainly calcareous and clayey with gravel and tuff. The color is reddish and sandy, highly-permeable, and rich in sub-moisture from the large underground water strata present in the area that builds up during the winter. These soil conditions allow the vine roots to access water and get through the driest summers without stress. The vineyards of Masseria Li Veli cover a total area of 33 hectares (80 acres), mainly cultivated with native alberello trained (goblet pruned without trellising) vines, with three two-bud spurs, at a high density planting (5120 plants per hectare). The layout is the settonce or “seven twelfths pattern,” whereby each vine finds itself in the center of a hexagon. This pattern was invented by Roman military engineers who for a long time used the Latin square layout, later adopting the quinconce (diamond pattern) and finally the settonce (ordo septuncialis). Today according to Li Veli, the settonce layout with the alberello training system offers, more than any other system, an ideal combination of beneficial effects: high planting density, maximum soil exploitation by the vine roots, maximum exposure of foliage to the sun, good circulation of air, vines forming rows in all directions making cultivation easier, maximum equilibrium of plant growth (all plants have the same space, both externally and below ground). Vinification at Masseria Li Veli involves hand-picked grapes that are then refrigerated to preserve the delicate aromas of the varietal. The grapes are pressed and then macerated on the skins for a very short period, once again under refrigeration, which promotes extraction of maximum aromatic potential, which clearly shows in the final product. Fermentation is cool and slow, which not only preserves varietal character, but also impedes Malolactic fermentation. Among the grapes cultivated at Masseria Li Veli are the Negroamaro, Primitivo, Susumaniello, Aleatico, and Verdeca. The wine under review is produced from 100% Verdeca, a white variety that has been cultivated for a many years exclusively in certain areas of Apulia, particularly in the Valle d’Itria. Because of its great resistance to disease and adaptability to different soils and conditions, for many years Verdeca was neglected and almost never used for varietal wines. Verdeca was almost always used for blending in dessert wines or in Vermouth, primarily for export. Masseria Li Veli started making varietal Verdeca in 2009 with the intent of showcasing the lovely and powerful characteristics of this historical local variety. Lush Nose with tropical fruit and chalky, mineral hints. Medium-bodied with firm acidity – good balance. Fruity with great structure and finesse – apple, apricot and pineapple notes with intense volcanic minerality. Long finish with evolving, layered complexity – very pretty – crisp and refreshing. Not for aging. At an average bottle price of $17.99 before the discount, this wine is a superb alternative to every day whites! 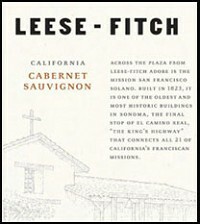 The 2010 Leese-Fitch Cabernet is a product of The Other Guys Winery, a subsidiary of the huge Sebastiani wine empire. The Leese-Fitch label is a value-conscience brand that strives to make high-quality, inexpensive wine that tastes at a price point $10 – $15 above its retail prices. Housed in the restored Leese-Fitch building located in Sonoma Square, the winery uses a mix of fruit from area growers, producing a Merlot, Pinot Noir, Chardonnay, Cabernet Sauvignon and Zinfandel. The building was originally built in 1836, and is an historical landmark in Sonoma Plaza, named after Jacob Leese and Henry Fitch, brothers-in-law to General Mariano Vallejo, the founder of the town of Sonoma. I generally eschew these easy-drinking west coast wines, usually because the value proposition isn’t there. But with Leese-Fitch, the price point is low-enough to make the ratio work. Ripe, juicy nose with black cherry jam and cedar hints. Medium-bodied with moderate acidity and supple, approachable tannins. Good balance. Youthful and fruity with bright red berry notes. Classically west coast – gulpable and easy drinking. Smooth finish without a lot of complexity – not for aging, simply for quaffing. At an average retail price of $10.99 per bottle before discount, this wine is a good value with no pretense! It’s no lie – I love the wines of southern France. Whether it is the massively complex and age-worthy wine of Châteauneuf-du-Pape, or some lovely, quaffable rose from the Côtes de Provence, many of my desert island wines would hail from that part of France that lovingly hugs the Mediterranean Sea. 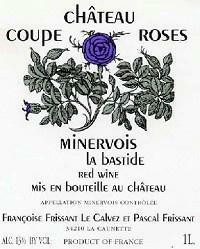 So it should come as no surprise to anyone that I would love the 2010 Château Coupe Roses from Minervois. Named for the French term for “fortified farm,” La Bastide is a youthful explosion of flavors with enough structure to give it some serious aging potential. Made from a blend of old-vine Carignan and Grenache, (and yes, in France old-vines actually means something) the wine is filled with all the great terrior elements that make southern French wines so appealing. The winery and vineyards are situated north-east of Carcassonne, which is located in the heart of the Languedoc. The climate is classically Mediterranean with warm, dry sunlit days and cool, still nights and promotes slow, steady maturation of the fruit. The vineyards are influenced by altitude, planted on barren, stony hillsides at between 800 to 1,200 feet above sea-level. The soils are composed largely of clay and chalk, which are perfect for retaining heat in the evening (chalk) and water during the day (clay). Large manganese deposits give the eponymous faded rose coloration to the top soil. At an average retail price of $14.99 per bottle before discount, this wine is a stunning value!